Florida blames all its elections problems on its counties, while missing major problems in its elections improvement report. Yesterday, Florida Secretary of State Ken Detzner released his long-awaited report on how the state’s elections system can be improved. He spent a month on a fact-finding mission, talking with county elections supervisors and other concerned constituents to produce this list of recommendations on “increased accessibility & efficiency in Florida elections.” But the only thing Detzner seemed to learn from the supervisors was how to throw them under the bus. The state secretary focuses mostly on the problem of long lines—Florida voters waited an average of forty-five minutes, the longest time of any state—and he goes out of his way to blame this on the county election officials. There is no mention of felony disenfranchisement at all, despite the work of the Florida Rights Restoration Coalition advocating for automatic voting rights restoration and Governor Rick Scott’s dialing back of progress made on this issue by his predecessor Governor Charlie Crist. Detzner fails to even mention the problem of confusing and trapping the formerly incarcerated with conflicting information about their voter eligibility. No acknowledgement of the “souls to the polls” campaign, where community organizers mobilize black churches to increase voter turnout in mostly marginalized communities. The report backhandedly refers to early voting on the Sunday before Election Day as a “regionally popular voting” day that most elections supervisors would rather do without. But there’s no mention of race and how it helps black voters despite a federal judge citing those reasons for why Florida could not ban it. Nothing on purging. Florida spent the better part of last year fighting for the right to purge eligible voters from rolls, falsely labeling thousands of them as “non-citizens.” This fight is still playing out in federal courts, but there’s no mention of this in the report. There’s nothing on the problem of voters being challenged, unbeknownst to them, by groups like True the Vote, also leading to confusion and eligible voters denied their rights. No mention of language assistance needs for Haitian and Creole voters, though this is one of the fastest growing populations in the state, and many of them do not speak or read English fluently. While the report talks about how to improve voter registration file processing and management, it says nothing about the law it passed that severely limits the time third-party voter registration organizations, like the NAACP, have to collect and turn over files to the county. There is existing litigation to reverse this as well, (it was temporarily blocked last year) but Detzner didn’t bother mentioning it. Despite the call from advocates around the state for a more modernized voter registration system, the report says little about it. The best it can offer is guidelines on how elections supervisors can better manage registration records. supervisors of elections have a responsibility to make the proper preparations for an election and their county commissions have the responsibility to provide the appropriate support to meet these needs…. However, some counties failed to prepare effectively and it reflected poorly on the entire state. Election supervisors probably could have better prepared if they weren’t sent on witch-hunts by the state to purge voters. Meanwhile, whose to blame for the disproportional burden placed on black and Latino voters for long-line waits. 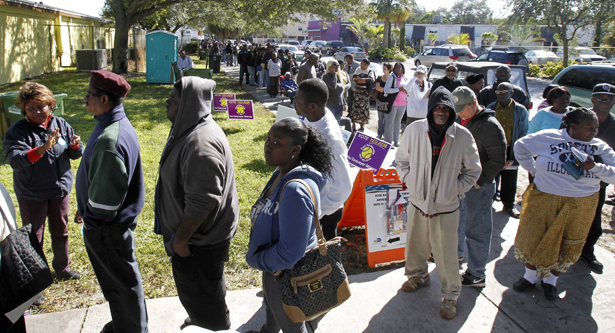 Or the 201,000 Floridians who were discouraged away from voting due to the election mishaps. It should also be noted that while Florida was far from the only state with these problems, they were emblematic of the finding by Massachusetts Institute of Technology that black and Latino voters waited twice as long to vote than whites across the nation. Detzner wrote in the report: “I can confidently say Florida conducted a fair election in 2012.” Given his weak analysis, it’s apparent that there must be some blindspots at the state-level, particularly where race is concerned. Read more about what’s next for the voting rights movement in Florida and beyond here.